Structural glass has transformed Alistair and JV Russell’s Victorian home into a modern masterpiece. The kitchen overlooked the rear garden through french doors and was very basic. Alistair and JV were determined to improve this space to make it the heart of the home, and contacted several architects for their input. The kitchen previously opened through french doors onto a scruffy patio, and the dark, narrow side return was wasted space. Plus Rooms is a family-run design and build company specialising in kitchen extensions and loft conversions. The company designed a single-storey glass extension which would link to the kitchen to create a stunning nine metre long, multi-functional space overlooking the garden. Planning permission took eight weeks to achieve, with the help of a specialist planning consultant employed by Plus Rooms, and work started the following month, in May 2012. The family remained living in the house during the project, moving from room to room to try to keep out of the builders’ way. “We had a small electric oven and ate out a lot while the kitchen was out of action,” says JV, a PR consultant who works from home. Steelwork supports the rear of the house, where structural walls to the side and back were removed in order to extend the kitchen sideways and out into the garden. An existing hall cupboard and a WC were demolished to create a sleek rectangular kitchen/family room, which now stretches across the entire width of the house, and new foundations were excavated for the extension, which has solid side walls. Only once the framework was in place could the glazing specification be accurately measured and ordered. The Russells’ extension was built using high performance, toughened self-cleaning glass. The outer pane of double-glazing is 10mm thick, with a 16mm argon-filled space and then a 6mm toughened inner pane of Pilkington glass. Glaziers were responsible for constructing the rear wall of the extension and the glass roof, which is supported by unusual glass ‘fins’. Pilkington Activ self-cleaning glass was chosen, with a coating that uses UV rays from the sun to break down dirt, which is then washed away by the rain. “You do still need to clean it occasionally, but it’s much easier to maintain than normal glass,” says JV. It was incredibly important looking back to have found contractors we could trust. Both Plus Rooms and Darek seemed to care as much as we did, if not occasionally more, about the quality of the final outcome. Alistair grew up in the Caribbean and JV is American, so they have both struggled to come to terms with the British weather. Building a glass room connects them to the garden and maximises any warmth from the sun. “We even enjoy hearing rain gently pattering on the glass roof,” says Alistair, who admits the couple were slightly concerned about being able to maintain a comfortable temperature in the room all year round. Their fears were groundless however, and the space is always warm and welcoming. The rest of the house has also undergone a dramatic programme of renovation, which was completed by a building contractor Alistair knew who had carried out work to his previous house. A new heating system was installed, with a horizontal hot water cylinder mounted in the eaves to save space, and every room has been given a complete makeover. The sitting and dining rooms form a grand double reception space on the ground floor, which now have decorative plaster mouldings and wall panelling, built-in shelving and feature lighting. Existing marble flooring in the hallway was professionally restored and the staircase has been repaired and painted. Alistair was then responsible for employing tradesmen and sourcing internal fixtures and fittings, including the kitchen cabinets and marble counters. Engineered wood flooring has been laid over electric underfloor heating, and lighting was carefully designed to enhance the glass structure. “I did have a go at some of the decorating myself, but we wanted to get the house finished as quickly as possible so it was easier to bring in professionals,” says Alistair, who decorated Lysander’s bedroom with colourful murals. Decorative plaster mouldings and wall panelling add a touch of glamour to the principal bedroom, which opens onto a balcony through a glazed door and has a new double-glazed sash window. A small bedroom on the first floor was converted into a luxurious en suite bathroom, which is now accessed from the principal bedroom instead of the landing and has a marble-clad shower, free-standing bath and twin French sinks. “We’ve enjoyed seeing the house come to life around us, and the glass family room extension is a major feature,” says JV. “This has been partly converted into a play area for Lysander, and is his favourite room in the house. Joining the two roof pitches proved to be a complicated piece of engineering, with the glass meeting at different angles, and project manager Robbie Bernard of Plus Rooms created a 3D model of the design, which uses glass fins to support the roof instead of a more traditional framework of aluminium or PVC. These were made from three pieces of glass laminated together to form a strong structure, which holds the other glass panels in place and looks spectacular. The front façade contains slim sections of aluminium, embedded into the glass itself and then covered by structural silicone for a subtle joint. Heat emissions are a major issue with glass, which is why high performance glazing was required to limit extremes of temperatures. A SAP calculation was presented to the building inspector to demonstrate that insulation in the walls and floor had been increased to compensate for the use of so much glass. glass in dry conditions, but they worked hard to make up some of the lost time. The £65,000 project ran smoothly overall, and was organised entirely by Plus Rooms, who handed over to the Russells to finish the interiors once the plumbing, plastering and electrics had been completed. HOME TRUTHS What was the high point of the project? When the glazing went in and we were able to start the decorative finishes was a milestone. We had about 20 people over to celebrate Thanksgiving, which was really nice. …and the low point? The short time we were without a kitchen and needed to cook food on a portable oven. What was your best buy? 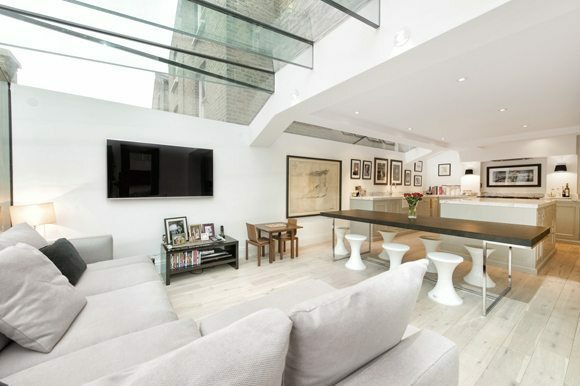 Probably the glass extension – it’s transformed the look and feel of this part of the house.…and your biggest extravagance? The marble for the bathroom and countertops wasn’t particularly cheap, and marble can be temperamental and needs to be handled with care.